By Kurtis Judd, Member-at-Large for the GCI Edit (February 2015): We, the Green Chemistry Initiative, are not associated with this product, but we do think that it’s a great option for household composting. If you’re looking for product information about The Greenlid, including where to purchase one for yourself, please visit www.thegreenlid.ca. Thanks! Despite its many benefits, composting has not become the fixture that recycling has in Canadian homes. Walk by most subdivisions in Ontario on garbage day and you’ll see a blue box at the end of almost every driveway, but the green bin is a less frequent sight. 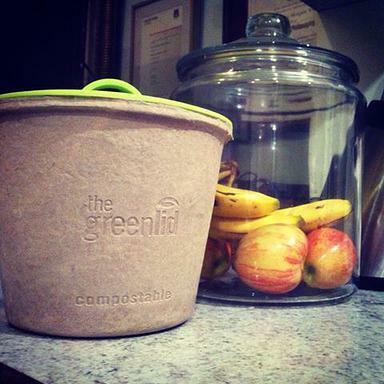 According to Statistics Canada, in 2011, 61% of Canadian households composted their organic waste in some form. This is up from 39% in 1994, but just by my general perceptions, which are based on the practices of friends and family, we can do better. I’ve had the conversation before, and many people seem to understand the importance of composting, but either aren’t sure how best to do it, or have tried it, and grew tired of dealing with the rotting mess in their kitchen that caused a fruit fly infestation, and left a rancid container to clean each time it was emptied. In apartments especially composting can be quite inconvenient, and this is enough to make some people not even bother. I asked the designers what their biggest challenge was in designing The Greenlid via their website, and Morgan Wyatt responded quickly. He said coming from an academic background, where research is easy, navigating the manufacturing world was difficult. “With manufacturers, there aren’t the same types of online resources, and there is a lot more direct interaction to find the right partner,” he said. Using Kickstarter, Morgan and Jackson reached their pledge goal of $25,000 on March 16, 2014 and will be sending the first batch of Greenlid packages out to pledge donors in the near future. They will also be pitching The Greenlid on CBC’s popular show Dragon’s Den on April 11 (set to air next season). For more information about The Greenlid visit their website at www.thegreenlid.ca, or check out some of the cool videos on their YouTube channel. Anything to get more people composting and diverting waste from landfills is a positive change, so if you have any friends or family who have decided to give up on composting, let them know about The Greenlid. This entry was posted in Green Initiatives, Kurtis Judd. Bookmark the permalink. Hi Beverly! You can buy The Greenlid online from the official website: http://www.thegreenlid.ca/#!our-products/c1kd0. They’re also sold at Home Hardware and soon at Home Depot locations, including some in Surrey. Try the store locator also on their website: http://www.thegreenlid.ca/#!store-locator/c15po. Hope that helps, and thank you for your interest and support! That’s great to hear! We’re actually not associated with The Greenlid, so you will have to pass on your ideas directly to them through their website. If you go through this link: http://www.thegreenlid.ca/#!store-locator/c15po and scroll right to the bottom of the page, there’s a way to contact them for distributing ideas. We hope it works out, and thanks again for the support. Thanks for the positive feedback, we also think this is a great product! We’re actually not associated with The Greenlid, so all purchasing and pricing information can be found elsewhere on their website here: http://www.thegreenlid.ca/. The tabs at the top of that website will direct you to an online store to purchase directly, or retailers near you that carry The Greenlid.